Let’s dissect a bit, shall we? First, this campaign conflates all of media. Then, it argues that “jokes are not evidence of bigotry.” Except the heart of the argument was never whether or not Kjellberg was himself a bigot—merely that his content featured references and imagery that bigots seemed increasingly attracted to, and as a result Disney decided to sever business ties. Finally, it ends on the odious hashtag #GasTheJokes—a pretty bold reference to the mass killing of Jews and other marginalized groups at the hands of the Nazis. The gambit is simple: If “the mainstream media” crows at a hashtag that mockingly references genocide, it’s evidence it’s run by oversensitive snowflakes who just can’t take a [deeply anti-semitic] joke. What a perfect way to distance YouTubers from allegations of anti-semitism. 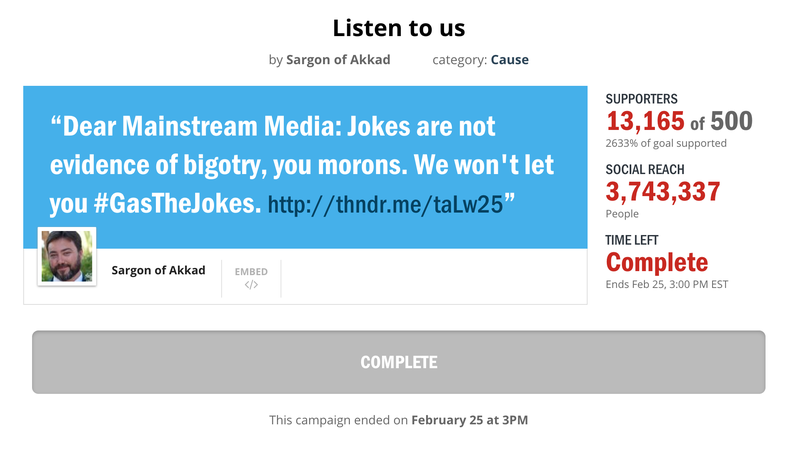 Of course it wasn’t just Sargon with his 500,000 subscribers getting in on the action. Boogie2988, a prominent vlogger with an audience of over 3 million subscribers, was probably the highest profile to be seen on the bandwagon. Daniel Keem, the personality behind DramaAlert—a sort of TMZ channel for YouTube gossip—also sent the link out to his 1.3 million Twitter followers. He spent the other week trying to get PewDiePie defenders to pressure the WSJ’s advertisers into pulling their support, a tactic he no doubt cribbed from GamerGate. As part of his campaign, Keem shared a 48-second vlog in which he shows a Verizon banner ad above a Wired story about PewDiePie, and then a tweet to Verizon threatening to cancel his plan with the carrier for supporting “slander.” (Keem seems to have confused slander with libel.) Though Keem told Verizon he was “switching back” four hours later, the initial tweet racked up over 1,000 retweets from sympathizers. “I know this might sound rich from me, Wall Street Journal, but your job is to report the news not create it,” Keem said in a recent vlog. (Aside from his gossip career, Keem has wrongly accused several individuals of pedophilia and was the target of several efforts to get him and his channel removed from YouTube.) Keem tweeted the link to Benjamin’s campaign imploring his followers to sign up, though he did not himself did not. “No comment,” he told Gizmodo over DM regarding his non-support. You’d be forgiven for not understanding what all this adds up to. Are YouTube fans mad that PewDiePie was dropped by Maker? Or are they upset that the Wall Street Journal reported this story in the first place? After all, the Thunderclap campaign tweets all point to a limp change.org petition to get YouTube and Disney to reconsider their relationship with Kjellberg. (For reference, last year’s change.org petition to boot Keem from YouTube garnered nearly three times as many signatures.) But the purpose of the campaign was, according to Benjamin’s own video on it, to “force [the media’s] hand and make them talk to us.” Over Twitter DM, Benjamin refused to give a comment to Gizmodo, claiming we’d wrongly associated him with the so-called “alt-right” in a previous article. Benjamin may not identify with the nebulous “alt right” or neo-Nazis, but he was once been referenced by Daily Stormer owner Andrew Anglin as someone whose videos were “leading people in our direction.” With campaigns like this one it’s easy to see why. Among the standard #GasTheJokes tweets were also those like the above, which reference the white supremacist “14 words” or called transgender Americans mentally ill. Many of the accounts featured the frog and/or milk emoji that have become associated with trolls and white supremacists, along with the standard-issue bio linkouts to their Gab.ai or Minds profiles. It’s almost like this was bound to happen when attempting to artificially trend a hashtag that has anti-semitic humor baked into it! Kjellberg is and has always been free to make whatever dumb jokes he wants. How an anti-semitic hashtag is supposed to stick it to the “mainstream media” for reporting on his choice to make these jokes or help distance PewDiePie from his missteps is beyond anyone’s best guess.